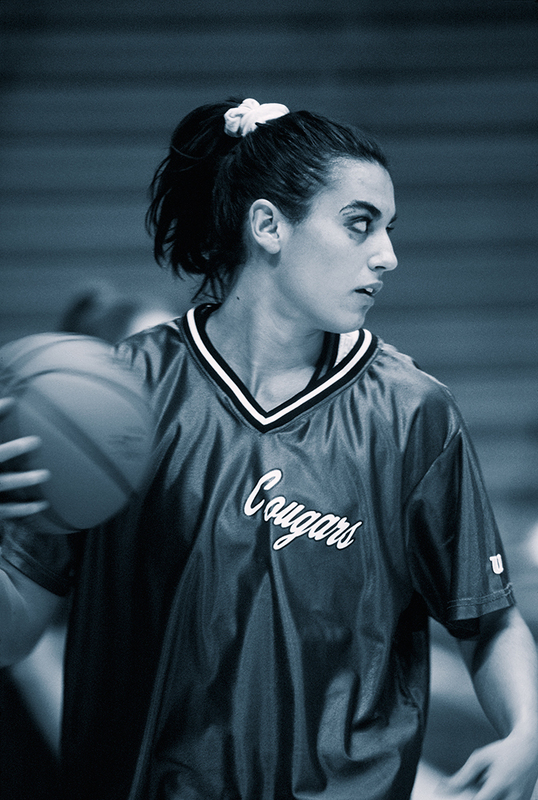 Literally and figuratively, Jumana Amer Salti has come a long way to play basketball at BYU. Of course, she isn’t your typical BYU basketball player. Yet when you consider the thousands of miles she has traveled and the scores of serendipitous events that have led her to Provo, she begins to look like a natural in a BYU uniform. Right now, though, she’s sitting at the end of the bench. It’s a Saturday afternoon at the Marriott Center, and with 14 minutes remaining in the first half, the BYU women’s basketball team is losing by 10 points to heavily favored University of Portland. Salti, a redshirt freshman from Amman, Jordan, is leaning forward slightly, eagerly awaiting her turn. Finally, Cougar coach Soni Adams summons her 6-foot-2-inch backup center into the action. As Salti takes the floor, she quickly adjusts the white scrunchee that holds her dark ponytail in place. Almost as quickly, she adjusts the overall complexion of the contest. Portland has taken command, but Salti’s aggressive style of play commands attention. Within 20 seconds of checking in, Salti picks up her first foul. Less than one minute later, she scores a layup off a nifty entry pass. 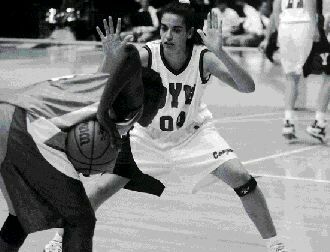 Ten seconds after that, she forces her opponent into a turnover. Fifty ticks later, Salti glides down court on a fast break, receives a pass, misses a layup, but follows her miss and scores. With that, the Cougars cut the deficit to just five points. Then she forces a Portland player into an errant pass. She alters an opponent’s shot and, in the same sequence, blocks another. Not long after that, she is whistled for setting an illegal screen. Nothing like adding a pinch of Salti to spice up a game. During a ten-minute stretch in the second half, Salti–she of the eclectic number double zero on her uniform– shoots an air ball, stands practically flat-footed to block another shot (the ball never even leaves the shooter’s hands), and leaps and crashes down hard on the floor as she fights for a loose ball. As a result of her fall, Salti’s arm is bleeding, and she leaves the game. Heading to the bench, she ex-changes high fives with her teammates and coaches. The sparse crowd acknowledges her effort, momentarily forgetting that the home team is trailing by 25 points. She flashes a 200-watt smile that lights up the Marriott Center. The scene begs a question. How in the world does a nice, non-LDS, Jordanian girl like Jumana Salti (pronounced Ju-mah-nuh Sahl-tee), the daughter of an American mother and a Palestinian father, wind up playing basketball at an LDS school like BYU? Well, it helps that she possesses a good turnaround jump shot, a knack for rebounding, and well-above-average height. Perhaps more important, however, is the fact that her parents are BYU graduates and that she has had two former BYU presidents, a princess, some newspaper clippings, some LDS Church representatives in Jordan, a little bit of luck–and a lot of destiny–on her side. Jumana Salti is the Michael Jordan of Jordan. Of course, that’s the equivalent of being the Wayne Gretzky of Greece. Or the Ty Detmer of Thailand. Still, Salti, who took women’s basketball to another level in Jordan, is proving she can play American basketball at BYU. In fact, she is one of the few Jordanian athletes ever to compete at the NCAA’s Division I level in any sport. In high school, Salti would be in class until 2:15, practice until 4:30, go home to grab something to eat, and then practice from 5 until 7 p.m. with her club team. After that, she would lift weights for an hour, study, and then go to bed. On weekends, she had her games. Starting with the third grade, she began attending the American Community School, a private institution for the children of expatriate and Jordanian families. When it came to sports, particularly basketball, she dominated. Yet the real triumph of the experience was that the team got there at all. Although the Jordanians were sponsored by several companies in Jordan, just days before the tournament began, the team still lacked about $5,000 needed for the trip to Japan. Fortuitously, the English-language newspaper in Amman detailed the team’s plight. One person who read about it was Princess Sarvath, the wife of Jordan’s Crown Prince Hassan, whose brother, King Hussein, is the head of state in Jordan. Apparently touched by the team’s desperate need, the princess donated the money necessary to send the Jordanians to the Orient. The team arrived two hours after the opening ceremonies began. The news reports about Salti and her team captured the attention of others as well. As a result, little did she know, Jumana was forming her own little link to BYU. During a visit in July 1994, then-BYU president Rex Lee toured Jordan and heard about this potential recruit whose parents had attended BYU in the 1960s. During that visit, President Lee met Amer and Rebecca Salti and invited Jumana to BYU. Not long after that, he wrote a letter to Jeanie Wilson, who was BYU’s head coach. When Adams took over the BYU women’s basketball program in 1994, she inherited the letter. “When the president speaks, you’d better take a look,” Adams says. After the Asia tournament in 1995, an LDS couple from Utah, Richard and Donna Butler, who are BYU alums and were serving in Jordan as representatives of the Church, also wrote Adams and sent her an impressive pile of newspaper clippings about Jumana. 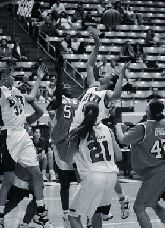 Consequently, Adams wrote a letter to Jumana and invited her to BYU to try out for the team, although Adams didn’t have a basketball scholarship for her. Salti decided to turn down her acceptance to Syracuse University (Salti never had had any contact with basketball coaches there) and came to Provo. As it turns out, Jumana considers herself lucky as well. “She was looking at the east of America,” Rebecca says of her daughter’s initial interest in Syracuse and other East-Coast schools. “Provo was the wrong direction. Destiny had something else for her.” Maybe destiny did lead her to BYU. Amer was a bright student who was eager to learn and grateful to be in America. He had arrived in Provo via the Arab Development Society in Jericho. Amer had studied at a school founded by Musa Alami, who had established a Boy’s Town of sorts on the West Bank. While attempting to reclaim land in the Jordan Valley, Alami started the school to educate young men and prepare them for college. For 10 years, Amer studied under Alami. Alami had visited the United States on numerous occasions and had met then-LDS Church President David O. McKay. President McKay in turn introduced Alami to BYU president Ernest L. Wilkinson, who later visited the project on the West Bank. It was President Wilkinson who personally invited Amer to further his education at BYU. Meanwhile, Amer and Rebecca’s friendship gradually bloomed, and a six-year courtship resulted in marriage in 1966. Both graduated from BYU (Amer also received his master’s degree from the school), and then the Saltis delved into their postgraduate education at various schools around the country and around the world. In 1975, they moved to Jordan. Amer, who stands 6-foot-2-inches, is quite an athlete himself. And it was he who provided the biggest boost to Jumana’s basketball career, although unwittingly. As a banker, he helped finance the $1.7 million gymnasium at the American Community School. It became the nation’s first hardwood basketball court. At the time, Amer could not have fathomed the role that gym would play in Jumana’s life. As she grew, Jumana played for her high school team as well as the Jazira Club team and steadily improved. She visited summer basketball camps in the United States to receive instruction from American college coaches at Utah, North Carolina, and Stanford. “I came in as raw as can be, but I learned a lot,” she says. Six months later, Jumana returned to her homeland. By the time she finished high school, she was faced with the decision of what college to attend. Initially, BYU wasn’t at the top of her list. “I never expected to be coming here,” Jumana says now. In the end, Jumana decided Provo was the place for her, although it hasn’t always been easy to be a foreign student-athlete at BYU. According to Jumana, there are only 50 Arab students at BYU, although they have formed a close-knit family. Some of them attend Jumana’s games. Jumana says she feels more comfortable all the time at BYU–not only with the atmosphere, but also with basketball. Last season, Jumana opted for a redshirt year in order to make the transition from international basketball to American basketball. After all, Jumana had never played with a U.S. women’s basketball, which is slightly smaller than the ball she had been used to in Jordan. She also had to get used to American rules, which are somewhat different from international rules. Upon arriving at BYU, Jumana admits, confidence was her biggest nemesis. Instead of being the center of attention, like she was in Jordan, she felt like just another player. “I thought everyone was better than me because I’m from Jordan,” she says. As for her future, Jumana eventually wants to go to law school or earn a master’s degree and, like her parents, return to Jordan and work. In Jumana’s mind, it’s doubtful Jordan will ever have a team that will compete at the Olympic level. Amer and Rebecca visited Jumana at BYU last fall for a few weeks, but not long enough to see her play in a game. Now, she talks to her parents on the telephone about every ten days, speaking in either English or Arabic–or both in the same sentence. Of course, she gives them updates on her games. “I tell them everything that happens,” she says. “That is the best support system ever.” She also has her grandmother, who drives down from Salt Lake City to watch her play. Among those Jumana could thank are a princess, several journalists, two LDS Church representatives, and a pair of late BYU presidents. 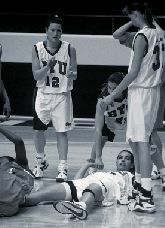 Indeed, Jumana Amer Salti must have been destined to play basketball at BYU. Jeff Call, a 1994 graduate of BYU, is an editor of Cougar Sports Magazine.